Christopher Dorner, a former Los Angeles officer, is suspected of killing a couple over the weekend and opening fire on four officers early Thursday, Feb. 7, 2013, killing one and critically wounding another. AP Photo/LAPD Police Dept. (AP) Christopher Dorner sees himself as a crusader, a 6-foot, 270-pound guardian angel who battles racism and helps those in need. That's based on a so-called "manifesto" posted by the former Los Angeles cop, who is being hunted by thousands of law enforcement personnel in California, and is wanted for the murders of three people, including one police officer. 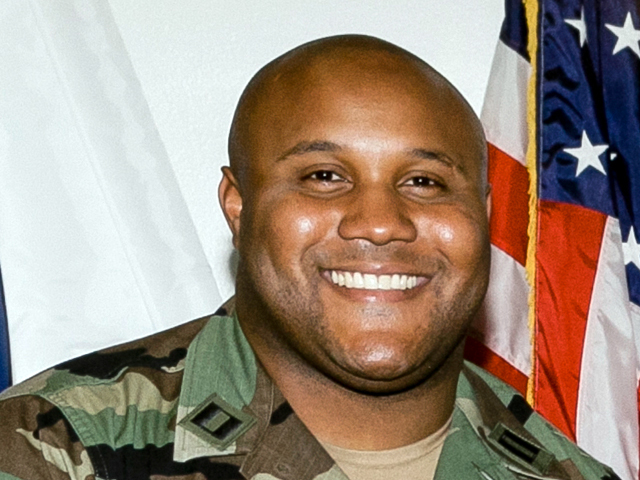 Dorner, 33, always wanted to be a cop and fulfilled that dream when he became a LAPD officer in 2005. The dream ended with his firing three years later, an event that, according to a 14-page manifesto police believe Dorner authored, led him to plot violent revenge against those who he believed were responsible. Authorities say he began carrying out the plan last weekend, killing a man and his fiancé, whose father represented Dorner when he fought to keep his job. On Thursday, the eighth anniversary of his first day on the job with the LAPD, police say Dorner ambushed two officers, killing one. "I know most of you who personally know me are in disbelief to hear from media reports that I am suspected of committing such horrendous murders and have taken drastic and shocking actions in the last couple of days," the manifesto reads. "You are saying to yourself that this is completely out of character of the man you knew who always wore a smile wherever he was seen." David Pighin, a neighbor of Dorner in the Orange County community of La Palma, said the ex-officer kept to himself and left his house and his black Nissan Titan, outfitted with tinted windows and custom rims, impeccably clean. "There wasn't a scratch on it," Pighin said. "I would see him getting out of his truck and walk straight into the house." Dorner has no children and court records show his wife filed for divorce in 2007, though there's no evidence one was granted. Pighin believed Dorner lived with his mother and possibly his sister. On Wednesday night, Pighin saw a white van with two armed SWAT officers in front of Dorner's house and later learned about the manhunt. "We were completely shocked," he said. "This is a good family that appeared to be really nice people. They were really admired in the neighborhood." The 33-year-old Dorner said he would use all of his training to avoid capture and track his targets. In addition to police work, Dorner served in the Naval Reserves, earning a rifle marksman ribbon and pistol expert medal. He served in a naval undersea warfare unit and various aviation training units, according to military records, and took a leave from the LAPD and deployed to Bahrain in 2006 and 2007. His last day with the Navy was Friday. "I will utilize every bit of small arms training, demolition, ordinance and survival training I've been given," the manifesto reads. "You have misjudged a sleeping giant." The manifesto included some 40 targets and warned that their families will be harmed. "I never had the opportunity to have a family of my own, I'm terminating yours," the manifesto says. The document indicates racism, real or perceived, is a strong motivation for Dorner. He recalled as a first-grader fighting another student at his Christian elementary school after the pupil used a racial slur. The principal punished the student, but also chastised Dorner for not turning the other cheek, "as Jesus did." "That day I made a life decision that I will not tolerate racial derogatory terms spoken to me," the manifesto says. Dorner also says he backed a fellow cadet in the police academy when other recruits sang Hitler youth songs and taunted the man, who was the son of a Holocaust survivor. And he recalled placing a fellow recruit in a choke hold after the man used a racial slur and refused to stop when Dorner objected. In 2008, he made a complaint against his field training officer, Sgt. Teresa Evans, and said that in the course of an arrest she kicked suspect Christopher Gettler, a schizophrenic. The police review board ruled against Dorner, however, and he was dismissed. As a result, Dorner says he lost everything, including his relationships with his mother, sister and close friends.